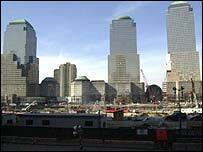 Forensic experts in New York say they have identified body parts of two of the 10 hijackers who flew planes into the World Trade Center on 11 September 2001. Ellen Borakove, a spokeswoman for the New York Medical Examiner's Office, said the identifications had been made using DNA samples provided by the Federal Bureau of Investigation (FBI). The FBI had collected the DNA from tiny traces of skin on the steering wheels of vehicles hired by the hijackers and from hair samples recovered from their hotel rooms. Earlier this month, the FBI provided profiles of all 10 hijackers, including alleged ringleader Mohammad Atta, so their remains could be separated from those of victims. "No names were attached to those profiles. We matched them, and we have matched two of those profiles to remains that we have," Ms Borakove said. "We haven't finished our work, so it may be more," she added. Nearly 18 months after the attacks, the forensic scientists have managed to identify remains belonging to at least 1,465 of the estimated 2,790 people reported killed in the attacks. Victims' relatives hope to establish a tomb of the unknown to house unidentified remains as part of a Ground Zero memorial, and do not want the hijackers included, reports say. The 10 hijackers have never been included in the official New York death toll. A third plane was flown into the Pentagon near Washington and a fourth crashed in Pennsylvania after passengers fought the hijackers. Ms Borakove said the New York medical teams had set themselves a target of identifying at least 2,000 sets of remains. "We'll keep working for as long as it takes, there's no time limit. It could be years," she said. Of the nearly 20,000 body parts recovered after the tragedy, a majority have yet to be identified.